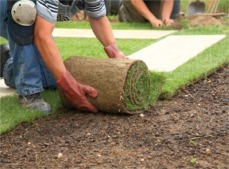 To grow good quality turf, it is essential that you start with good quality soil. This soil needs to provide the full spectrum of nutrients to the growing plants so that after the 18 months development period, when the turf is first harvested, the plants have an excellent rootbase with mycorrhizal mycelia, strong tillers, perfectly formed green leaves and an immune system to enable the plant to withstand the stress of transportation (usually involving being refrigerated to reduce the heat created due to excessive synthetic nitrogen being used). Turf is a crop that is taken from the land and the nutrients taken up by the plant from the soil are lost. Whilst this can also be said of hay / silage, etc the difference is that turf also takes part of the top soil. It is important that this soil is replaced and that the complete rootzone is minerally balanced as early in the new turf’s life as possible. The Field Science system involves a visit by the Field Science representative to the turf farm to identify how we can help, gain an understanding of the history of the land and the fertiliser regime. Soil samples will be taken and, once they have been returned from the third party laboratory, a report is sent to the farm outlining the results and offering a quotation for tailor-made trace element dressings for the areas tested. These dressings are granular and last for a full turf-growing season which is normally 18 months but, being tailor-made, it is also possible to have 1 year or 2 year if required.